How can you produce the No. 4 time in history and perhaps end up with the World Record? That confusing situation now presents itself after one of the greatest 4x4s ever run indoors climaxed Clemson’s Tiger Paw Invitational. Houston led off with Amere Lattin (46.33) and Texas A&M’s Ilolo Izu was just a step behind at 46.50. Obi Igbokwe stretched the Cougar lead with a 44.93 to Bryce Deadmon’s 45.15. But on the third leg, Houston’s Jermaine Holt lost a little ground with his 45.80 to Kyree Johnson’s 45.67. Then came the fireworks. 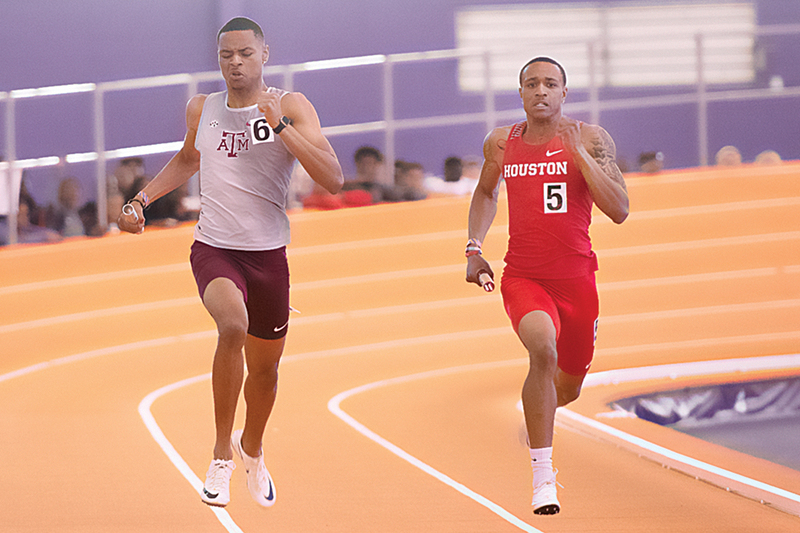 Kahmari Montgomery sealed a Houston win with his 44.45, needing every bit of it to hold off fast-charging Devin Dixon, who produced the fastest-ever relay leg in indoor history, 44.24 (topping the 44.35 that Rai Benjamin ran for USC in last year’s NCAA meet). Final times: Houston 3:01.51, A&M 3:01.56, Nos. 4 & 5 on the all-time world list. But none of the three marks ahead of Houston on the all-time list stand as the official World Record. That honor goes to Poland’s 3:01.77 from last year, as both USC (3:00.77) and Florida (3:01.43) produced their faster times with mixed-nationality foursomes. The No. 2 time ever, 3:01.39 by A&M behind USC at last year’s NCAA, wasn’t ratified because proper testing wasn’t done. Apparently all the technical requirements for ratification were met by Houston and a record application will be filed. Earlier in the meet, Igbokwe had won the 400 in 45.35 to Dixon’s 45.68. In the hurdles, Kentucky junior Daniel Roberts blasted a 7.52 to tie for No. 7 among collegians ever. Mississippi State frosh Marco Arop won the 800 by more than three seconds with his 1:45.90, becoming No. 7 collegian all-time. On the women’s side, Ohio State’s Anavia Battle captured a deep 200 with her 23.00 PR. Miami soph Tiara McMinn edged Florida State’s Cortney Jones in the hurdles, 8.06 to 8.07. Texas A&M’s women produced a world-leading 3:29.96 in the 4×4, anchored by Syaira Richardson’s 51.56. 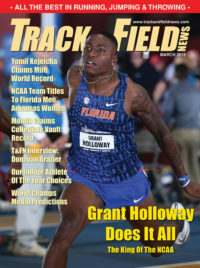 Florida soph Grant Holloway highlighted Arkansas’s Tyson Invitational with a near-Collegiate Record in the hurdles, his world-leading 7.43 a hundredth off but still a world leader. In the 4×4, Florida produced a solid 3:03.17 to beat Baylor’s 3:04.49, with Holloway contributing the fastest leg of the race, a 44.94 second carry. 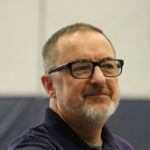 Andrew Irwin took a loaded vault competition with a world-leading 19-3½ (5.88), a mark that lasted less than a day before Sam Kendricks topped it in France (“fun while it lasted lol,” tweeted Irwin). He beat a solid collegiate field that included NCAA champ Chris Nilsen of South Dakota at 18-8¾ (5.71), Kansas frosh Zach Bradford (Ks) 18-5½ (5.63) in 3rd and Devin King of Southeastern Louisiana in 4th at 18-5½. Akron’s Matt Ludwig and Baylor frosh KC Lightfoot (Bay) tied for 5th at 18-1¾ (5.53), the same height as 7th-placer Hussain Al-Hizam of Kansas, the reigning NCAA indoor champ. In the 200, North Carolina A&T senior Kayla White ran a world-leading 22.82. In the hurdles, USC’s Chanel Brissett moved to =8 among all-time collegians with her 7.90 win over Arkansas’s Janeek Brown (7.95). Even condensed down to a one-day meet in a race against Seattle’s Saturday “Snowpocalypse”, the Husky Classic on the large UW oval produced extraordinary distance times. Texas soph Sam Worley led four under 4:00 in the mile with his 3:57.98. Cooper Teare of Oregon took the 3000 in 7:50.66 as the first 13 all broke 8:00. Colorado’s Joe Klecker ran 13:35.97 in the 5000, outkicking Eastern Kentucky frosh James Sugira (13:37.88). Nikki Hiltz took the women’s mile in 4:31.42 ahead of the 4:31.71 for Hannah Fields. Kim Conley grabbed 3rd in 4:33.72. Oregon’s Jessica Hull ran 8:53.91 to win a loaded 3000. Boise State’s Allie Ostrander ran 2nd in 8:55.26 as Nicole Hutchinson of Villanova (8:55.68), Arkansas frosh Lauren Gregory (8:55.97) and teammate Tayler Werner (8:56.97), and New Mexico’s Ednah Kurgat (8:59.78) all dipped under 9:00. In the 5000, Stanford’s Fiona O’Keeffe ran 15:35.77 behind the 15:35.28 of Canadian Regan Yee. Makenna Morley of Colorado followed in 15:37.23, ahead of Washington’s Isobel Batt-Doyle (15:40.53) and Stanford’s Abbie McNulty (15:42.13). In a night of great races at the Hemery Valentine Invitational in Boston, the best was crafted by Stanford alum Sean McGorty, now running for the Bowerman TC. His world-leading 13:21.35 win over Britain’s Mark Scott (13:21.97) made him the No. 10 American ever. “I trusted my gut,” he said. Laura Roesler looked sharp in a powerful 1:59.80 win over four laps, briefly moving to No. 10 on the U.S. all-time list. It was her second race indoors this season after a nearly 3-year gap since she ran in the ’16 World Indoors. The mile was also entertaining, as Mississippi soph Waleed Suliman ran a 3:56.78 to become the 530th American under 4:00. He ushered Nos. 531–533 across the line as well, with two more coming in the next section. Chase Ealey showed that she might just have what it takes to become a force in the shot. At New Mexico’s Kirby Invitational, the 24-year-old Oklahoma State alum tossed the ball a PR 61-9¾ (18.84) in the third round to finish just ahead of Maggie Ewen’s 61-8¼ (18.80). Kortney Ross won the women’s vault with a 15-2¼ (4.63) to beat Jenn Suhr, who ended up 2nd at 15-¼ (4.58). It was Suhr’s first competition since she ended her outdoor campaign last July. UCLA frosh Sondre Guttormsen won the men’s vault with a Norwegian Record 18-9½ (5.73). The mile went to Indiana’s Kyle Mau (3:57.61) while Olin Hacker of Wisconsin took the 3000 in 7:53.88. BYU’s Erica Birk won the women’s 3000 in 9:00.69, and Amy Davis of Wisconsin took the 5000 in 15:47.80. The outdoor 100H WR holder showed off her winter training by capturing the sprints at the Texas Tech Shootout. Keni Harrison edged Jenna Prandini in the 60, 7.33–7.34 and her 23.10 also won the 200. Shardia Lawrence of Kansas State bounded 44-0 (13.41) to win the triple jump that saw 5 go past 43-feet (13.11). Jordan Geist of Arizona took the shot on the final throw with his 69-4¾ (21.15) over Texas’s Tripp Piperi (66-3/20.19). Texas frosh Jonathan Jones, a World Junior 400 finalist from Barbados, dropped a hint of his collegiate upside with a 45.38 win.